Children are the innocent victims of poverty in every culture. Being a child from a poor family means not getting needed medical care or being unable to attend school. It may mean that if they survive the malnutrition of childhood, they are still likely to grow up to be parents whose children will also be at higher risk of malnutrition, illiteracy, illness, or even death. The cycle of poverty can be cruel. By promoting the basic education in developing countries, we can elevate the standards by which needy children are encouraged to live and to grow into self-reliant adults. Rah-e-Amal has helped one hundred & fifty deprived children to take the first step in the direction by beginning a process of education and learning. Rah-e-Amal School is the brain child of a very dedicated down to earth lady Mrs. Zehra Fasahat. It was started by her after seeing some young children collecting garbage from a dump. Those children were offered education as well as love which they readily accepted. It started with ten student and now after a passage of six years the strength of the students has increased to one hundred and fifty students. The School is totally free for the students. The cost of high quality tuition, books, stationery, uniforms, nutrition, and complete health care is provided by the school. The curriculum is the same as the prescribed by the Federal Government. In addition instruction also include classes on Computer literacy and Handicrafts. 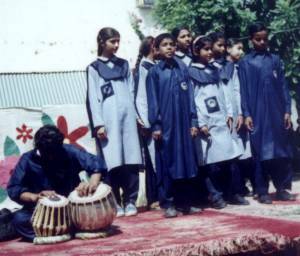 The school caters up to Sixth class education only for the severely deprived street children who lack the opportunities and mostly roam the street while their parents are busy looking for a livelihood. Care is taken that the children are given the love and trust they rightfully deserve and apart from education, Mrs.Fasahat holds character building lessons in order to impart and instill good values in children. Over the span of six years there has been a remarkable change in the attitude of all the children towards life as well as each other.